Previously, on MinerBumping... 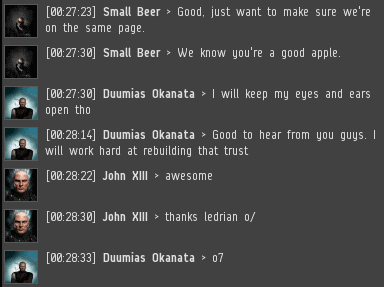 Notorious rebel spy Ledrian Saisima contacted two of our Agents on an alt. 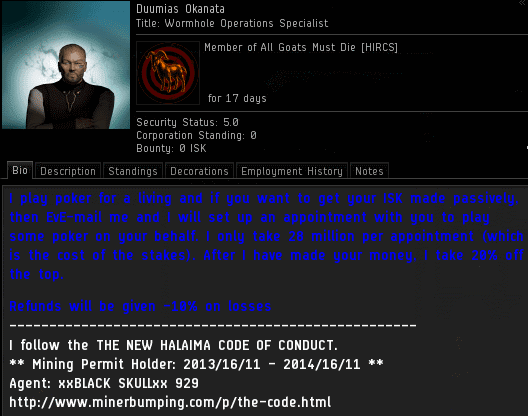 Ledrian's alt made a scandalous accusation: NEW ORDER DEATH DEALRS CEO xxBLACK SKULLxx 929 was a traitor! Ledrian's alt was Duumias Okanata. Ironically, in his bio, Duumias claimed to have purchased a mining permit from the same guy he was accusing of treason. As usual, Ledrian was cryptic and overdramatic. In time of war, when truth is so precious, it must be attended by a bodyguard of hype. 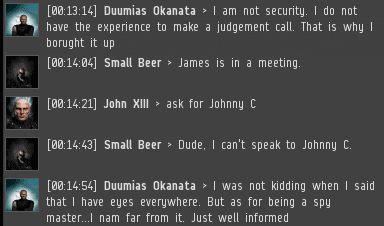 Agents Small Beer and John XIII were ready to report this intel directly to me at a moment's notice. 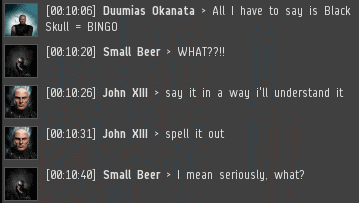 Small Beer was just about to send the evidence, until he remembered that Ledrian hadn't provided any yet. 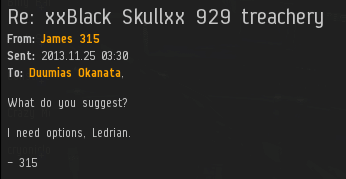 Ledrian leveled another extraordinary accusation at the NODD CEO: All of his kills--hundreds of billions of isk worth of dead miners--were staged! 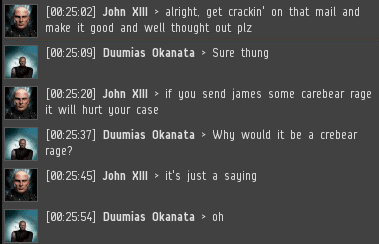 It's unclear how Ledrian knew that xxBLACK SKULLxx 929 never botched a gank, "EVER". 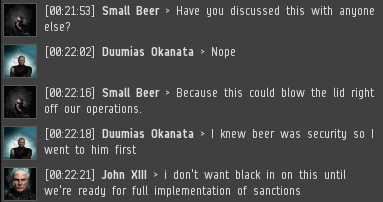 Maybe the same way CCP Navigator knew that SOMER Blink honored every blink played "without exception". After unveiling his bombshells, Ledrian claimed to have eyes everywhere. This is impossible. I'm the one who has eyes and ears everywhere. So where would there be room for all of Ledrian's eyes? 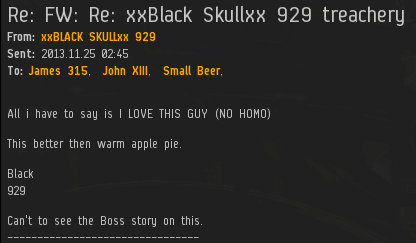 Ledrian was convinced that xxBLACK SKULLxx 929 was secretly a traitor operating at the highest levels, putting the entire New Order in grave peril. For this most serious of crimes, Ledrian recommended a temporary suspension. Just like in real life. Given the severity of the accusation and the potential penalty, John recommended Ledrian draw all of this up into a formal memorandum. No doubt Ledrian was eager to be rewarded for his intel, but John knew it was too sensitive a matter to be rushed. A full investigation would need to be launched. In the meantime, everything must be kept quiet. John cautioned Ledrian not to get too emotional. No need to worry; Ledrian had ice in his veins, especially after mining so much of it. Ledrian was hopeful that this intel would rehabilitate his image among the New Order, putting to rest the memories of his promise to destroy us all on January 1, 2014. I received Ledrian's memorandum. In writing everything out, Ledrian realized, "Not really that much evidence when looked at like this," and offered the conclusion, "Just saying". I wonder how many intelligence reports in real life accuse someone of treason and end with, "Just saying"? 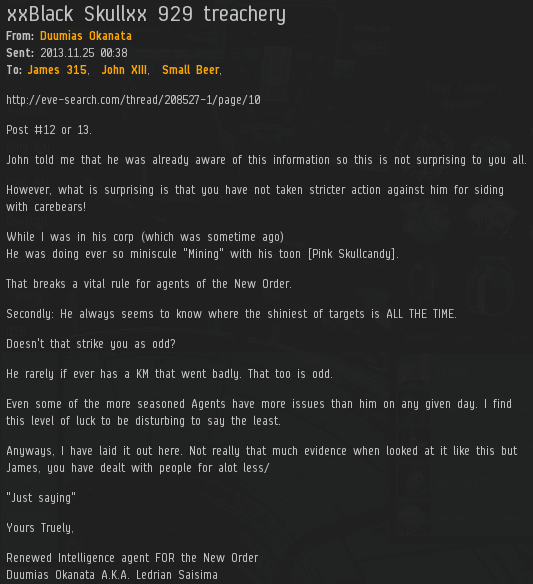 As a senior member of the New Order intelligence apparatus, the intel was immediately forwarded to xxBLACK SKULLxx 929, who was eager for more information. I attempted to contact Ledrian for more advice, but he went radio silent. As a result, no further action can be taken in this case. But I'm sure that at the very moment the New Order needs him most, Ledrian Saisima will return. I cant express the amount of physical laughing out loud i did reading this. Not the "lol" we so frequently spam forth, to express our approval of a joke, or funny anecdote, a laugh. Out loud, like a fool, -glad im the only one in the room, so i dont have to explain it to people who just wouldnt get it- laugh. Multiple times. When most people type 'lol', it means something like 'i am acknowledging that you made an attempt at humor, but it wasn't so gut-wrenchingly that i actually laughed out loud'. In contrast, when people type 'LOL', it usually means 'your humor was of exceptional quality. i at least chuckled, and perhaps even laughed out loud'. "John cautioned Ledrian not to get too emotional. No need to worry; Ledrian had ice in his veins, especially after mining so much of it." Lol my fav quote too! I think about miners that way a lot. EVE lore tells us that a capsuleer's nervous system is bonded to his ship, so the capsuleer "feels" everything his ship experiences -- the rush of acceleration as the ship enters warp; the hot sting of lasers raking across shields; the sudden, disorienting shock as ECM systems daze a ship's sensors. So what do miners feel each day? Does a Mackinaw's pilot suffer brain-freeze as he crams fistful after fistful of ice into his two mouths? Do Hulks feel any pain as they swallow rocks until their stomachs almost burst, only to vomit it all into a trash can for a waiting Orca to slurp up? Does a Skiff gag on its own odor as it huddles inside its reinforced armored shell, hoping the next attack won't crack it open? Talking about lore I wonder how could a capusleer, of all the amazing possibilites his status grants him, decide to pick mining? How could this powerful, immortal demigod who can jump freely from star to star and feel the space radiation through his sensor choose to spend his unending life sitting in front of a rock to gather crumbles, using his power for nothing more than increasing how much crumbles can his mining laser automatically gather? I don't understand. "When the Catalysts come and slay one of these sad beasts, what does the Capsuleer inside feel?" Well, in the RP construction you're operating in, the player is AFK, so the capsuleer is ... asleep? He probably feels the same way you would if you were murdered in your sleep, while you were on duty in a war zone. "Damn, I guess sleeping while piloting in dangerous space was a bad idea after all. ", is a good estimate. They are both Real Men of Genius. NEWS FLASH: I saw an article in Yahoo! news today about asteroid mining in our solar system beginning in 2016... Just use Google and search for "Yahoo 5 space projects". 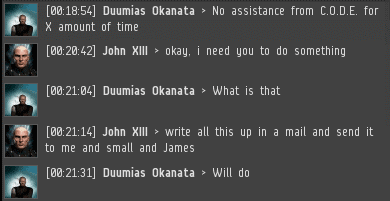 James 315, we need to work on ideas right away to make sure Deep Space Industries and Planetary Resources get permits and remain compliant at all times. It would be a shame at this stage in our technological development here on Earth for these mining corps to lose their valuable assets due to non-compliance botting and bot-aspirant behavior. NASA better get a permit, too! The mining will be done by unmanned drones - aka bots. So sorry. That is not going to happen. I was hoping for some traditional chivalry - trial by combat. It would have been good to end with Black ganking Lendrian.